Convert MOV to MP4, FLV, AVI easily and other 150+ video & audio formats. How can I convert MOV to MP4 on my Android device? Android phone has got the largest market shares in mobile world. However, when it comes to incompatible issues like .mov video format and Android phone, it will be frustrated. So if you can convert videos on your Android devices compatible format .mp4, for example, it will be more enjoyable. To convert MOV to MP4 on Android, you have to get help from an Android video converter app. Below we will introduce you to top 5 best MOV to MP4 converter apps for Android phones and tablets. Video Converter Android has got 5 million installs. It is one of the recommended apps to convert MOV to MP4 on Android phones and tablets. This app is a handy tool for users who always enjoy videos from a variety of resources. It is a lightweight app for Android devices at 837K. This MOV to MP4 converter app can work on Android 2.0, or above. It has easy-to-use interface and has ability to convert image files. For video format, you can convert MPG, MOV, WEBM, AVI, WMV, DIVX, DAV, FLV and more. Furthermore, you can use this Android video converter app to extract audio from video for reducing the file size. This MOV to MP4 converter app for Android allows you to convert almost any kinds of multi-media formats, including MP4, MOV, MP3, OGG, M4A, AVI, MPEG, and more. Media Converter also can be a video editor, helping you to do basic video editing. It allows you to cut or trim video to multiple clips. And you can only extract the audio from a media file for making a ringtone for your phone. Other features like video cropping and rotating are also supported. 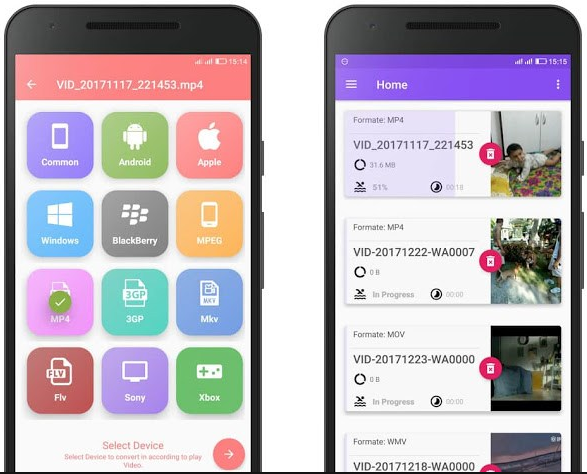 When converting MOV to MP4 on Android devices, you are able to customize the parameters for the output video, including, resolution, bitrate, frame rate and audio bitrate. Video Format Factory is another Android converter app for MOV to MP4 converting. It supports all kinds of video and audio formats, including MOV, MP4, AVI, FLV, MKV, FLAC, WMA, MP3, OGG, and more. This MOV to MP4 converter app for Android comes with multiple functions. It has the ability to trim/cut, split, rotate, reverse and compress videos. You can also add audio to a video, or extract audio file from a video. Another useful feature is to create GIF from videos. To convert MOV to MP4 on Android with Video Format Factory, simply upload video by tapping on “Add” icon, and select the output format as MP4, and then tap on the “Convert” button to start the conversion. 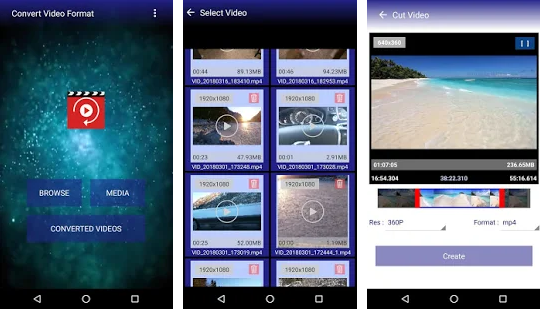 This video converter app for Android allows you to convert videos in any formats on your Android devices for totally free. You can import video in format of MOV, MP4, AVI, FLV, MKV, and more for converting to other formats. The conversion step is very simple. You are able to preset the output format on your Android device at MOV, WMV, MP4, MPEG1, MPEG2, 3G2, MP3, WMA, etc. And set parameters for the output format by customizing resolution, size, bitrate, duration and more. To make the video share easily with your friends, you can reduce the video size with this app. After the presetting, you can upload the MOV video file to your Android device, and then convert it to MP4 or other format. VidSoftLap Video Converter is another MOV to MP4 converter for Android. It has an easy-to-use and intuitive interface. With it, you are able to convert video formats between MP4, MPEG, FLV, MOV, WMV, MKV, AVI, 3GP, VOB, and more. Furthermore, you can also use it to edit videos by trimming, joining, rotating, cropping, stabilizing and more. This powerful tool allows you to add effects to the video or make slow motion video. If you want to get the audio file from a video, VidSoftLap Video Converter can help you do that easily. It supports to convert and save videos to Android, Windows, Lumia, BlackBerry, Samsung Galaxy, Sony and Apple devices. This video converter app is free but come with ads. 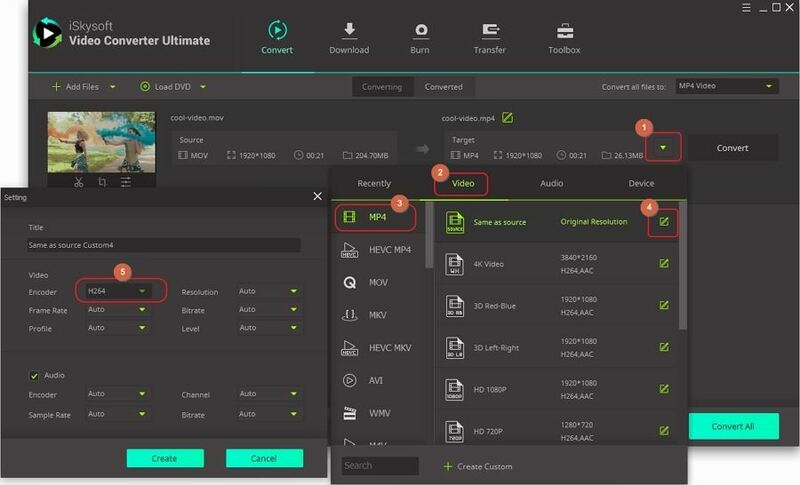 For Mac and Windows PC users, we highly recommend you to use iSkysoft Video Converter Ultimate to convert MOV to MP4 format. It can convert all kinds of video and audio formats and DVD files to other formats while keeping the original file quality. Only drag-and-drop is needed for uploading the files. And you can also input the file from your devices like iPhone, Android, iPad, and Camera directly. Batch conversion is supported. So you are able to import more than one MOV files to the program and convert them to MP4 and other formats at one time. What’s more, it has the ability to edit the videos and merge separate video clips into one video. Another handy feature of this video converter program is that it helps you to download online videos and convert the video to your desired format directly, which is useful when you want to get the incompatible online video to your devices. It is a fast video converter to help you to convert videos, audio, and DVD in high quality. You can convert almost any video formats to more than 150+ output formats. Even large video and audio files can be converted losslessly at 90X faster speed. You can enhance your video with the built-in video editing tools before converting. There are multiple output options like export to formats, devices and uploading to sites.